King’s Way Christian Schools represents over four decades of Christian care and education. Today, we serve approximately 950 students from 12 months through 12th grade. Here at King’s Way, we are dedicated to providing our students with a Christian education. We believe a Christian school is more than adding Bible classes to a regular school curriculum, it is our desire to help students grow personally in their relationship with the Lord, their peers and with those in authority, whether in the classroom, on the playground, or on the playing field. Our small classes ensure that a student’s individual progress, concerns and successes are easily tracked by faculty and administration. Our staffs’ quality and passion helps to build a culture that will prepare our students to make an impact on the world around them by assuring each child of their potential and assisting them in reaching their goals. Notice of nondiscriminatory policy as to students: King’s Way Christian Schools admits students of any race, color national and ethnic origin to all the rights, privileges, programs, and activities generally accorded or made available to students at the school. It does not discriminate on the basis of race, color, national and ethnic origin in administration of its educational policies, admission policies, scholarship and loan programs, and athletic and other school-administered programs. King’s Way Christian Schools began in 1971. King’s Way Christian Schools began in 1971 with the opening of the Peter Pan Daycare, a ministry of Vancouver Church. As the children who attended reached school age, parents appealed to the leadership to expand the program into kindergarten and first grade. Soon thereafter, classes were added. In 1977, the church and daycare moved to a new facility at their current location of 3300 NE 78th Street. 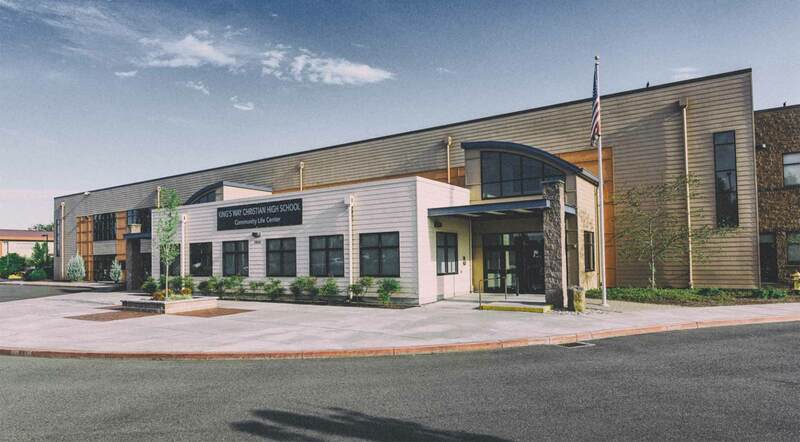 The church agreed to expand the program further, and King’s Way Christian School was launched under the leadership of Administrator Sally Clark. The school opened that year with two kindergarten classes and one first grade class. The plan was to grow the school a grade at a time, up to the fourth grade. However, King’s Way quickly became well known in the community as a quality private school, and requests were expressed to expand more quickly and into higher grade levels. In 1981, the church added on to its building, enabling King’s Way to grow more rapidly. Three more times over the course of the next twenty-five years, the church would meet the growing needs of King’s Way with expansions and new buildings. This gracious gift of building space without the burden of mortgage debt has enabled King’s Way to continue to offer high quality private Christian education at a very affordable price. Today, King’s Way offers care and classes from 12 months through 12th grade, serving nearly 850 children and their families. In 2015, Vancouver Church took the first steps to bring independence to King’s Way by creating an independent 501(c)(3) corporation, providing King’s Way with new opportunities to execute its mission. As close partners in ministry, Vancouver Church and King’s Way continue to work together to make disciples who can experience a whole new life with Jesus, like Jesus, more every day.